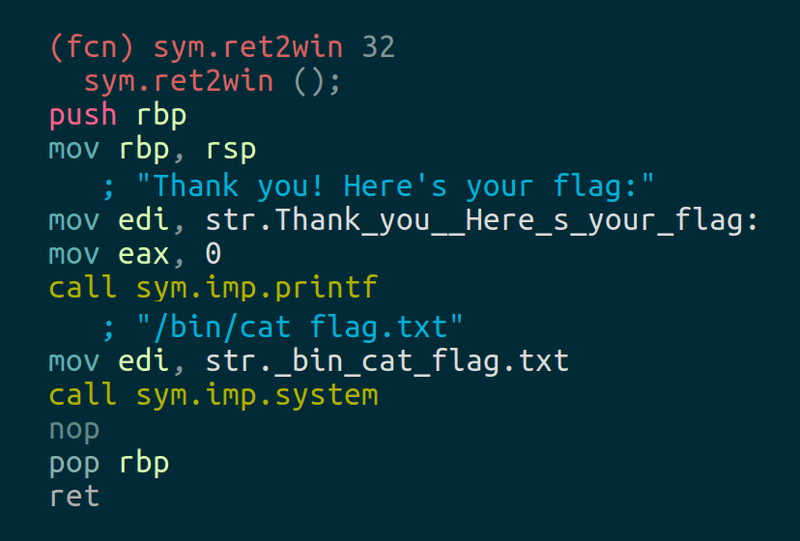 Locate a method within the binary that you want to call and do so by overwriting a saved return address on the stack. Click below to download the binary. Take the time to read these challenge pages, there aren't any spoilers and they contain important information that could save you some frustration. If you're unfamiliar with ROP tools of the trade then check out the beginner's guide. As it states; you'll feed each binary with a quantity of garbage followed by your ROP chain. In this case there is a magic method we want to call and we'll do so by overwriting a saved return address on the stack. Certainly nothing that could be called a 'chain' by any stretch of the imagination but we've got to start somewhere. We'll do a little RE to confirm some information but nothing serious. It's worth confirming this before each challenge but typically you'll need 40 bytes of garbage to reach the saved return address in the 64bit binaries and 44 bytes in the 32bit binaries. You can solve this challenge with a variety of tools, even the echo command will work, although pwntools is suggested. If you decided to go for a more complex exploit than a ret2win then be aware that input is truncated for these simpler challenges. Find out how many bytes you have to construct your chain in each challenge using ltrace <binary> and looking at the call to fgets(). If your ROP chain seems perfect but the binary is crashing before printing the flag see the common pitfalls section of the beginner's guide, especially if you're using Ubuntu 18.04.